We are linked up to: Tot School Gathering Place. It's been a busy two weeks, and it has been a sunny and hot weekend! We had quite a few outings and had lots of outdoor time. We did have a few cold, rainy days, and on one of those days we attempted playing with shaving cream. We started with just a small cup. The pictures are deceiving; she looks like she is enjoying herself, but each time she got even a little bit on her fingers, she held them up for me to clean. After a few minutes of play with the cup, I sunk two Weebles in the cream. She tried to pick them up, but gave up quickly. Coming to me to get her hands wiped off, after trying to wipe them on the chair behind her. Our Art activity last week was colouring with crayons. I have been looking for 'chubby' crayons everywhere and finally found a set, although they are not as large as I remember them being. I gave her two on her first trial, so she would not be overwhelmed by to many colours. She tried to chew on them a bit, but mostly made lines by tapping the crayons on the paper. Not exactly an activity, but on one of our outings we were given some new dresses! They are not the best pictures, she is wiggly and didn't want to show them off. They were made by my friend, her site is HERE, check it out!! We were also given a hand made sun hat, but little miss has yet to leave it on long enough to get a picture. 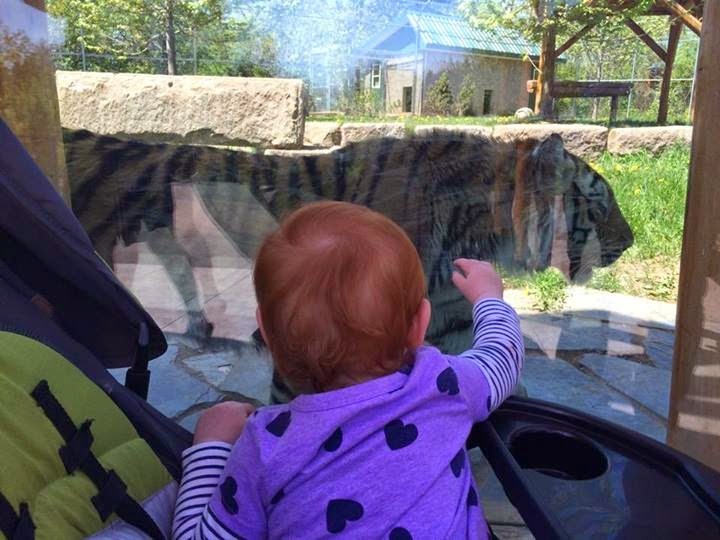 Finally, the coup de grace of our week, Daddy took us to the zoo! We visited the Magnetic Hill Zoo in Moncton. Salean loved it, especially the big cats, monkeys and snakes! This little monkey startled Salean, but she played with it for quite awhile! 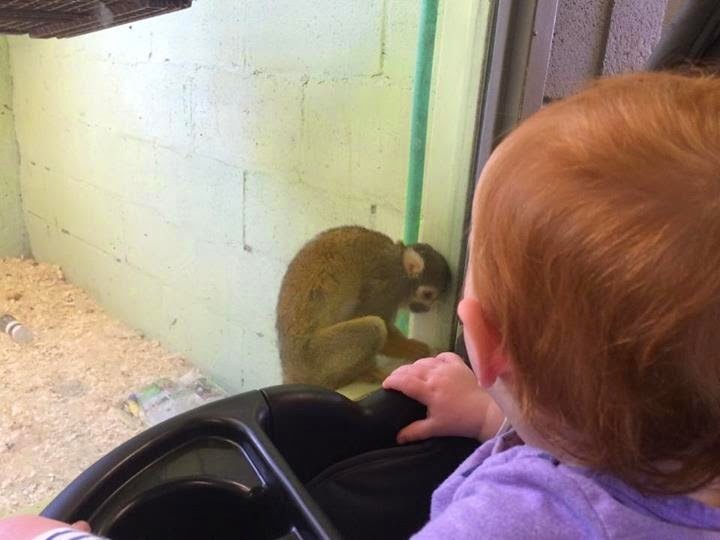 If she touched the glass, the monkey followed her finger. Daddy played along to, making the little guy jump all around. Getting close to the tigers. 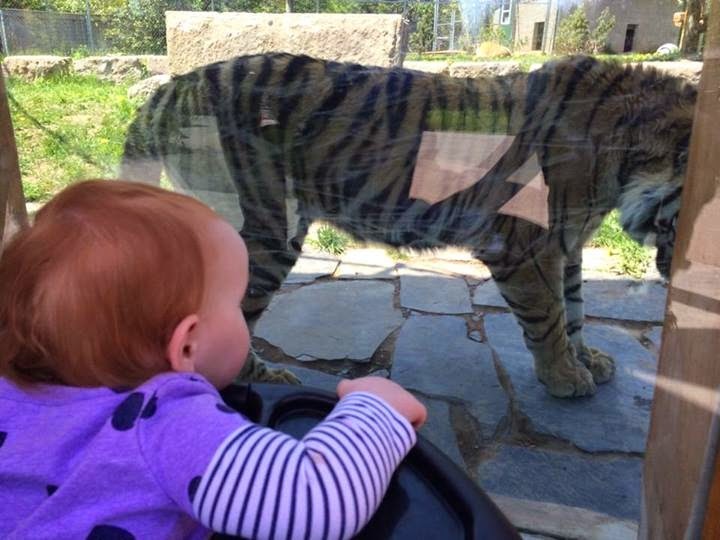 They have a huge enclosure with a few large glass walls. We were lucky one of the tigers was pacing when we were there. We also got the same experience with a black jaguar, but didn't get any good pictures of her interacting with it. A lovely peacock. The picture below, she is pointing to the peacock, she started shrieking and was quite surprised when he shrieked back! I didn't get many pictures at the zoo, I forgot to charge my camera and the back up batteries I brought turned out to be duds, too. The tiger and monkey pictures were taken by cell phone. The pictures we did get are good enough for her scrapbook, and the memories are better! That was our week in a nutshell! Hope everyone had a great weekend, as well!